Everyone deserves a second or even a third chance but few of us get even half a chance - one mistake and that's it. Not lucky Jose Lammar, 35, of Mahaut. His cup overflows with chances. Lammar grew up in a Christian home where he was exposed to and was taught about the good works of Jesus Christ. Unfortunately, Lammar decided to live a life that was not exactly straight or narrow. And he fell. After 20 years living on the streets, Lammar believes that God allowed all those bad things to happen to him so that he could share the gospel to anyone willing to listen. And what a story he has to tell. Lammar told the SUN that when he was three weeks old his mother left and never returned. He did not know his father. So he was raised by his adopted mother Althia Pinard, a woman of faith who instilled the beliefs of the church in him very early. But that Christian life was not attractive to Lammar and he soon became a slave to cocaine; he stole and he went to prison. "I thought what I was doing in the world was best for me. I made choices in my life as a young man growing up. I found myself into drugs; at 15 years I started to do cocaine and stealing people things, started to go prison and I believed that was the best for me," he said. Lammar said his family neglected him because he made bad decisions; therefore, he found comfort being on the streets. One day the police shot Lammar. He lost his left leg. After that incident Lammar was in the care of his adopted mother but he was called back to the drugs and went back to the streets. The streets soon became home but since he had only one leg he couldn't move freely. In search for money for food and primarily drugs, Lammar spent most of his time outside Save-a-lot supermarket and banks begging for money from strangers. "I thought the best for me was to sit down by Save-a-lot, by the banks, as people gave me the money I took it to buy more drugs. I did not even have time to eat. At the end of the day I did not have no money and had to be sleeping all about and waking up hungry," he said. The lifestyle he had chosen became tiring so Lammar decided that he needed to change his environment. La Plaine became his new home and there Lammar accepted Jesus into his life once again. Upon his arrival to La Plaine, Lammar was introduced to missionaries Michael and Glenda Coupe who helped him with food, shelter and employment. Michael Coup told Sun that before he was saved he was in a similar situation as Lammar- hooked on cocaine and had frequent stays in prison. "I too came from a background of drugs and alcohol, especially cocaine, and I was in and out of jail; so I knew exactly where he was in his life," said Coupe. Lammar asked Coupe to pray for him; however, Coupe said "When you ready to repent and have a new life and you ready to put your faith in Christ then we can talk." Coupe said he and Lammar had that conversation on a Thursday and that following Sunday Lammar came to church and gave his heart and life to Jesus Christ. Following that Sunday, Coupe said he began to help Lammar identify triggering mechanisms such as music or smells. From then on Lammar was no longer a beggar and the Coupe family took care of him. However, they knew that they couldn't allow Lammar to develop a level of dependency. "I knew that if we were not careful we would create a dependency so we opened a little restaurant, Turtle Bay Café and I told him he was going to be the cashier," said Coupe. Coupe said that people questioned his decision but he knew employment was important to Lammar. Michael and Glenda Coupe didn't only offer Lammar employment they taught him business ethics, business management, employee management and taxation. Coupe added that once he and his wife made that investment they turned over the business to Lammar and stepped out. 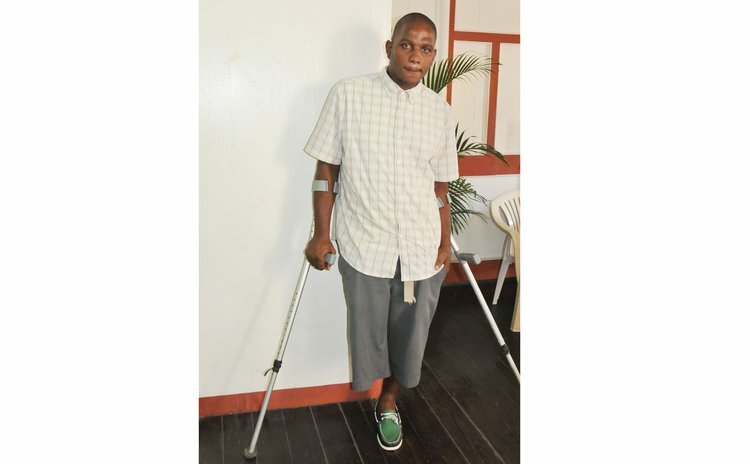 "Tourists from around the world when they come into the restaurant and they ask how he lost his leg he immediately goes into the gospel, so as a result of his testimony the gospel is being spread," said Coupe. "When Tropical Storm Erika took place we lost Jungle Bay. There were 60 employees that were giving us business and Sam Raphael would stop by and pass with guests…they were really invested in the Jose's life they knew he was trying to build a business and as a result of that we have taken a financial hit." Jose Lammar was baptized on March 8, 2015; he attends the La Plaine Baptist Church.